How to shred chicken breast and thighs? Here are 3 easy ways to make shredded chicken without using fork and knife. 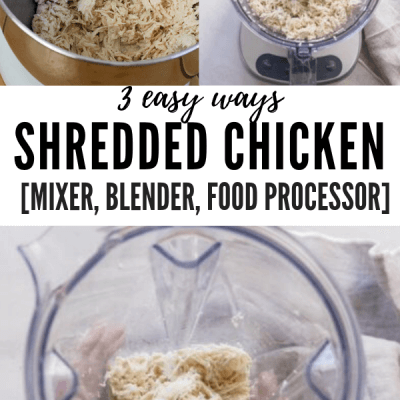 Best ways to shred chicken fast using a mixer, blender, food processor! If you’re wondering how to shred chicken breast, I’m bringing you the 3 easiest ways to make shredded chicken! Shredded chicken has changed my life. 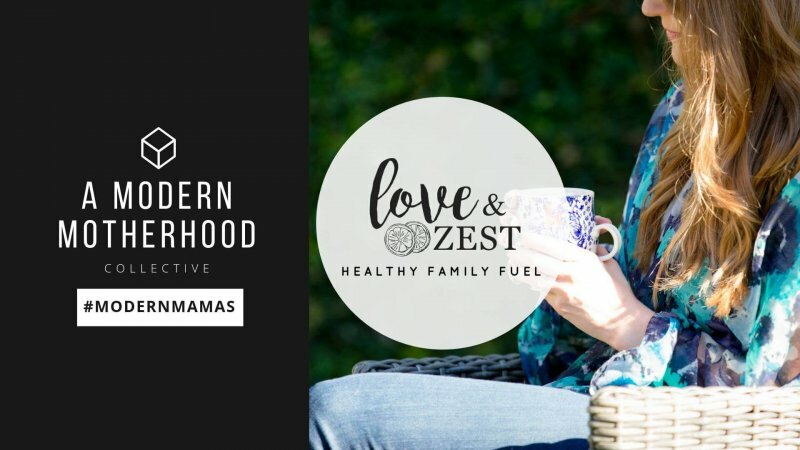 Okay, that may be a little dramatic but it sure has made our weeknights easier! And I’m all about that. If I’m begin honest, we eat out a little too much. It’s definitely something that we are always striving to work on as a family. We are budgeters and manage our finances through Quicken. We really don’t “think” we eat out much or “feel” like we eat out much, but you can’t hide from the numbers. If you manage your finances and look at the data weekly or monthly, it’s like an in-your-face-you-can’t-hide-from-it-truth. So we’re all about working on different strategies to aid in this process of “It’s 8pm and we just walked in the door from work, we’re too tired to cook so let’s go to Taco Tuesday.” Ya’ll know what I’m talking about?? Enter how to shred chicken without using a fork and a knife. So I’m all about mission: how to shred chicken fast. 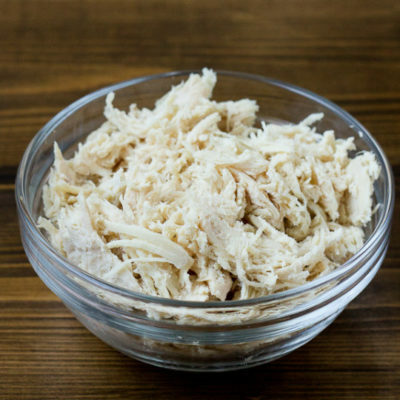 Once you cook your chicken (click here if you need a quick instant pot shredded chicken recipe), it’s time to shred it. Of course you can use a fork and a knife but the hand mixer, KitchenAid, blender, and food processor are much more efficient. 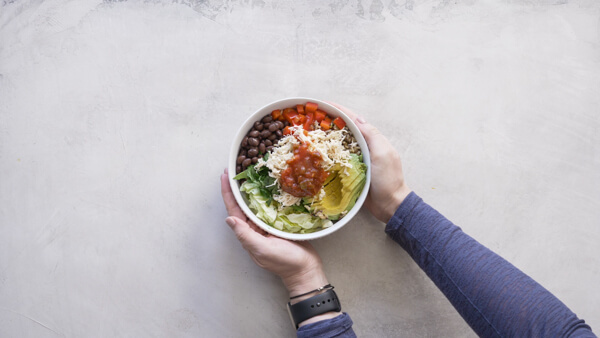 If you’ve ever wondered how your favorite chicken salad restaurants get that deliciously shredded chicken, they are likely using one of these 3 methods of shredding to get evenly shredded pieces of chicken, rather than uneven chunks. I think it’s best to allow the chicken to rest at least 5 minutes before shredding so that you don’t release too much moisture and dry out your chicken breast with shredding and this also helps you to prevent over beating the chicken into a mushy mess. How to shred chicken in mixer? 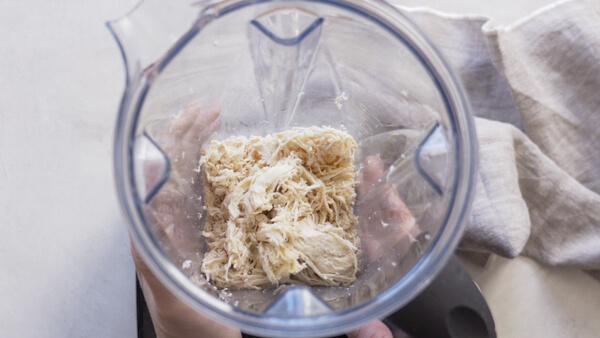 My absolutely favorite way to shred chicken is using the hand mixer! Major perks to shredding chicken right in the instant pot or slow cooker– and not dirtying another dish! Place hand mixer into your instant pot, slow cooker or mixing bowl, and slowly increase speed while using a mixing motion to shred the chicken breast. This method only takes less than a minute, depending on how much chicken you’re using. In my opinion, using the hand mixer is the best way to shred chicken! And then there’s always the stand mixer. I don’t keep this on my countertop so it’s not as efficient for me to use anymore. But it’s fastest way to shred chicken and basically no effort on your part, just let the mixer do the shredding! Place cooked chicken breast (and thighs if using) into the mixing bowl, using paddle attachment beat chicken until it’s shredded. 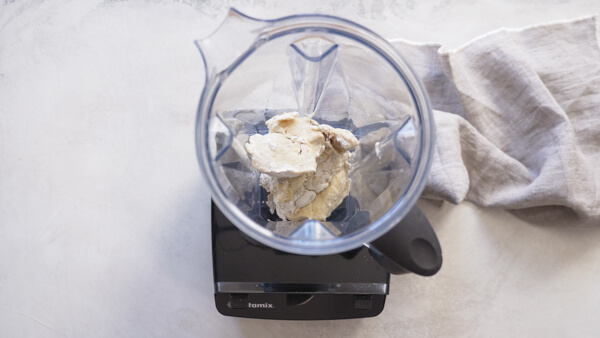 Can you shred chicken in a blender? Yes, I have used a blender to shred chicken. My Vitamix works great to shred chicken to the perfect consistency but it definitely works best if you have the tamper. 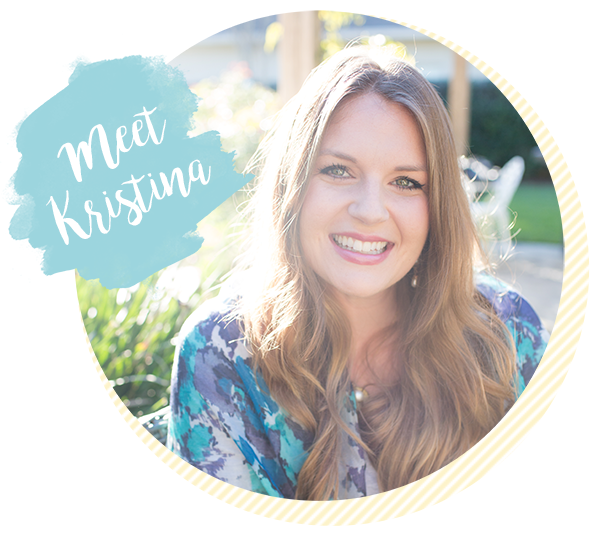 Plus, my Vitamix is a kitchen appliance staple that I use on the daily so PTL for it’s multipurpose use! It truly is the best blender that I’ve ever owned. How to shred chicken breast in the food processor? Shredding chicken breast in the food processor is a little bit of a science. While it can definitely be done, be careful not to over process the chicken. 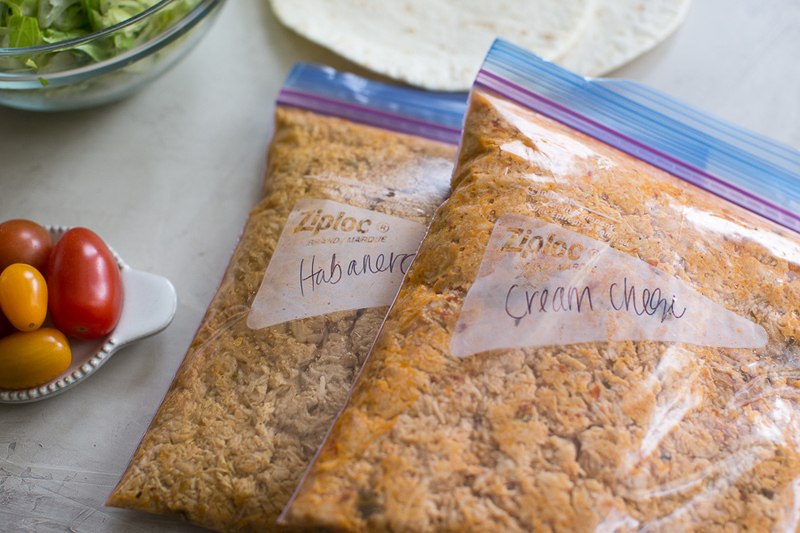 If there are any chunks that are too large, the best way to get those smaller without ruining the whole batch of shredded chicken is to pull them out and quickly shred in your hands. Or you can dump out the shredded chicken into a bowl and place the chicken breast that needs more shredding back into the food processor for a quick chop. Definitely doable but requires a few more steps and care! 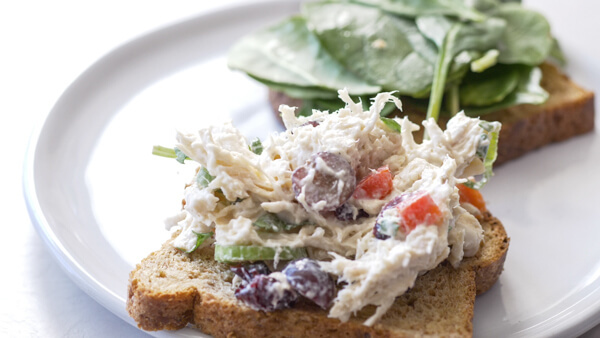 This method is how I like to shred chicken for baby– and it also works great for chicken salad. 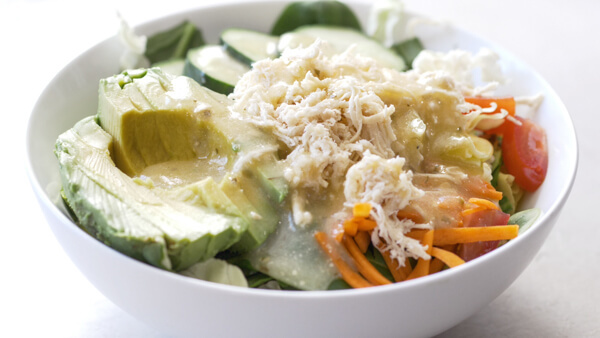 Want to know the best kept secret about shredded chicken breast? Shredded chicken can be frozen! Freeze prepped chicken breast in proportioned bags to make it easy for defrosting as you need it! Easy as pie guys. It will change your life. Now that you know how to shred chicken breast, be sure to check out our post on best shredded chicken recipes! 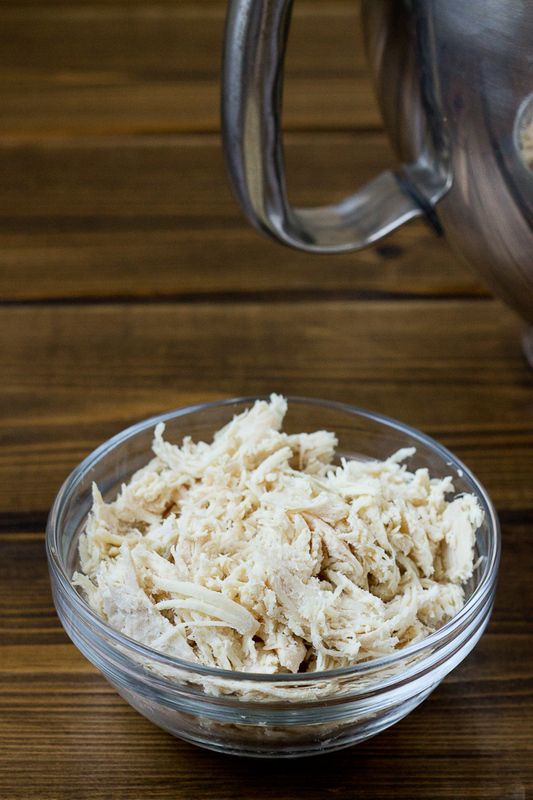 And if you need to know how to cook shredded chicken in the instant pot, check out our recipe for Instant Pot Shredded Chicken! 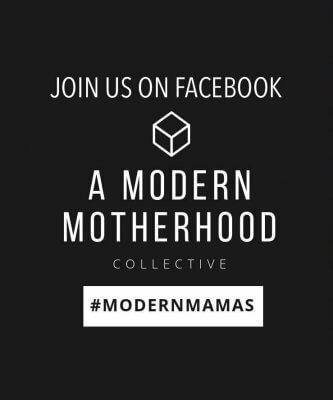 And if you’re working on meal prep, check out our other meal prep posts! 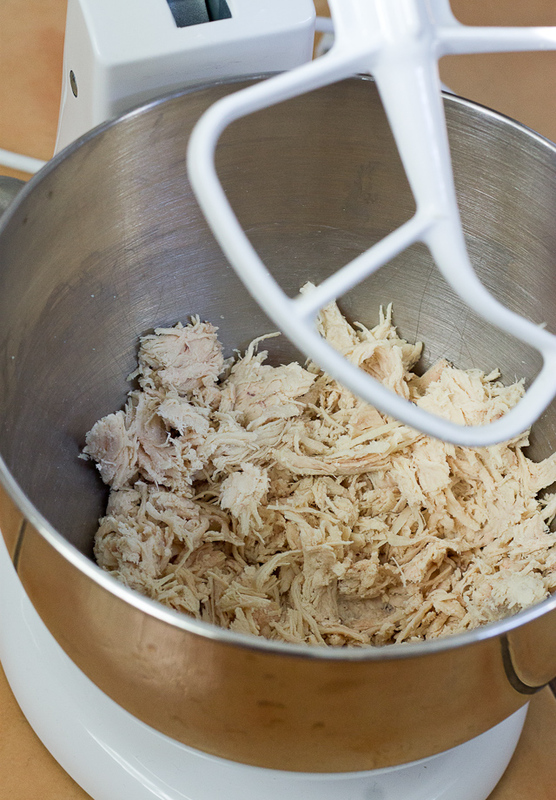 Shred chicken using a mixer, you can use a hand mixer or Kitchen Aid mixer to shred chicken. Place cooked chicken breast into mixing bowl and shred on low speed until chicken is fully chopped. Shred chicken using a blender, place chicken a high powered blender and shred on low, increasing speed until chicken is shredded. Use tamper to push chicken down into blades. You may need to turn blender off and give it a little shake to move the chicken around a bit to get all the chicken shredded. Shred chicken using a food processor, place chicken in the food processor and take care not to overprices the chicken. 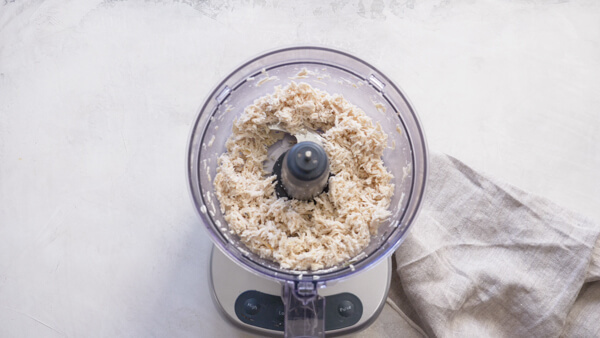 If any large chunks remain, remove from food processor and shred by hand or remove shredded chicken and place larger chunks back into food process for a quick shred. Nutrition info based on 4 ounces shredded chicken. For how to cook chicken in the Instant Pot, check out this post. What To Make with Shredded Chicken?, check out this post. Love this recipe! I’ve been cooking up a pot regularly and freezing in meal portion baggies. So far, I’ve used in Chop Suey, Sweet and Sour, Pulled chicken and Love and Zest Chicken Fajita Stuffed Sweet potatoes which are awesome! Makes meal planning so much easier when the “protein” is already cooked and ready to go! So glad to hear it! Thanks Ellen. Shredded chicken sounds so yummy. I’d suggest using low-sodium broth (or just water) for lower salt intake. I prepare chicken in water (and sometimes tomatoes) in the CrockPot, and it seems to do well without the broth. Great point! I always use low sodium broth for myself..while encouraging my athlete to use regular broth. Love the chicken in tomato idea, thanks for sharing!! Now that Jase has been packing lunch (since we got a copy of your book in November) I have a hard time having enough left-overs for my own lunches. This is just the kind of tip I needed today. Oh, and I am totally dying for a pressure cooker. This recipe is yet another great way to use one. Great post! I like to prep chicken ahead of time too. I use BBQ sauce and make pulled chicken for lunches!